Second week of nail tech school has come and gone already. 14 more weeks of classes then several more of practical skill practice (is that redundant?) to go! Last Saturday wasn't much to write about. Because I'd only had one week of instruction, I wasn't yet qualified to give manicures to real clients, so I spent the day keeping up with laundry needs of the salon and studying my notes. It paid off this week on Tuesday and Wednesday though. Tuesday was a test day, and I took three chapters' tests. I passed them all (one took two tries because of tricky wording) and then Rachel practiced manicuring on me. I feel bad, because I try to eliminate cuticles and ugly nail shapes myself for this blog, so I didn't leave her much to practice with. Wait'll we get to toes...she'll have plenty to work with. So this Saturday was much more lively! I was officially on the books and tested out of a basic manicure, a paraffin manicure, a hot oil manicure, and shellac (which is actually gel at our school). This week, I learned (and probably should have known beforehand), that gel and Shellac are used interchangeably now. Shellac is a CND-only name. Sort of like how everyone calls bandages "Band-aids". I think the formula is slightly different between that and gel, but the principle is the same. The gel needs to be cured under UV light to dry. It dries quickly under the light, and is supposed to last longer than regular lacquer. In my school, though the service is advertised as "Shellac", it's not technically Shellac because we use the Gelish brand, which, as you may have guessed, is a gel. I performed a gel manicure on one 'client', but more on that later. As a courtesy to the clients I do not personally know, I will not be using anyone's name that I don't personally know. 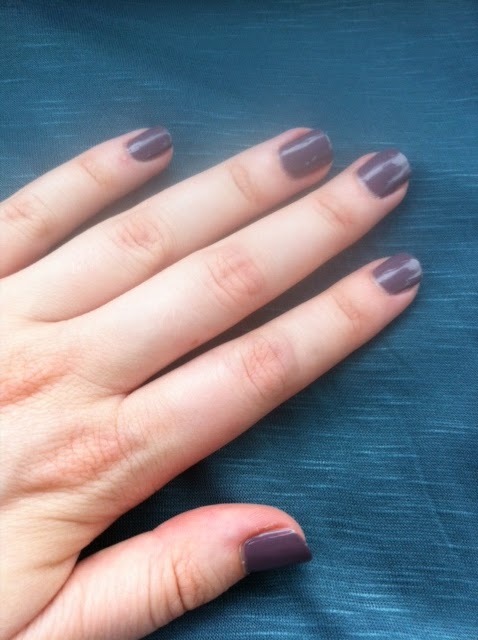 My first client was a new-to-me older woman who came in for a basic manicure with no color. It was nice to start the whole experience off with a stranger, so I could seriously practice my interpersonal skills. It's obviously much less easy to talk to someone when all you have is small talk to jump off with. By the end of her manicure, we were both very comfortable with each other and had exchanged stories and laughs. She also asked that I give her my name and number so she could book future appointments specifically with me, which really touched me. I took time to educate her on what I was using, and how she could help deal with her main concern, which was dry cuticles. In Colorado, that's always an uphill battle, so I gave her tips and some products to work with to keep them in good shape post-service. She was lovely. I finished up the day by practicing gels on our school's receptionist, Sarah. She had some trouble with the removal of her old gel polish, so I focused on getting her nails in good shape for the new treatment. She's always in the salon, and interfaces with everyone that comes through, so it was nice to chat privately and get to know each other better. I didn't snap a picture of her final look. So that's the second week, which flew by now that I have more than laundry to do! Besides the distinction between gel and shellac, I picked up some valuable lessons. First, I need to manage and keep an eye on the time much more closely. I'll be adding a small desk clock to my kit to place in plain sight during procedures. It's not necessary, but it's something I know will keep me focused on that pitfall in my skills. Second, paraffin treatments do not need a lot of wax to be effective. In fact, too much can be harmful to the final result. Chloe's right hand was overly-buttered, so I had to do some extra working in to get them mixed in. I'm also going to look into those creepy finger condoms that you can roll over one finger. Why? During my first service, I had a bandaid over my thumb, which was red and sore from a hangnail removal. It was not pleasant to look at, so I decided to cover it for the service. This wound up being too difficult to manage, especially during the massage, as the lotion simply slid the bandaid off. I consulted with my client, to see if she was comfortable with me removing the bandage, and she was. If I'd had a finger condom on, I could've simply covered it. Have you had any experience with gel vs. Shellac? Do you have a favorite? What's your favorite part of a hand and forearm massage? What does your manicurist do for you that you find special among other manicurists? As always, feel free to grill me, and I'll try my best to answer. I always get clients asking for shellac. . .but because my school doesn't use it, I say we have something better. . . and tell them about Opallac haha! P.s I find it so so strange that you aren't wearing gloves. . . if you have ANY contraindications (such as your sore thumb hangnail) that should be covered at all times! Gloves are soooo important.. you don't know what clients can have - sometimes even they don't know if they have any contraindications. We've also been taught to wear gloves when filing nails (more so when doing acrylics or gels because you file the nails more frequently and harder) in case any blood draws! Just thought i'd give you a heads up because I'd hate for you to contract a disease or wart from a client! We're told that if we see something we're unsure of, to immediately contact the instructor and they will tell us if we can proceed or not. If the client has any type of issue that the instructor doesn't recognize, we stop service. In the U.S., it's very uncommon for manicurists to wear gloves. I envision it taking away from the relaxation portion of the manicure, solely because it is not a common practice in the U.S. It's interesting that it's different from country to country. That's something I had never considered. All clients must sanitize before their procedure (with hand sanitizer). All implements are disinfected before each use, and all materials are one-time use. I've had CND and OPI Gel. Both held up for the same amount of time and had lots of shine. Thank you for updating us, I'm really enjoying reading about your journey! I love that so many bloggers are now going to school, I think it's awesome! I just graduated in June and just started working in a salon this month. I LOVE Gelish, it's my favorite by far. Good luck and I look forward to reading more about your experience. I couldn't answer the last two, because I never get my nails done by another tech. Well, what's the point when I can do my own Gelish for free. Shellac is a power polish which means it doesn't have the staying power of a true gel polish (which is why they've launched Brisa Lite - to help with longevity, smoothing etc). Depending on your clients nails, it seems that you can get another 25-50% wear out of a true gel polish. I've worn Artistic and NSI gel polish and it's not lasted anywhere near as long as Gelish, nor has it left my nails in a good condition. Gelish rocks and you won't find me going elsewhere! Shellac is not my preferred UV cured gel - I found it wrinkly and it peeled very quickly when I had it done. I use OPI GelColor personally; I like the fact that it's a well known brand and the colours are the same across all the systems. Fun to read! I don't ever get manicures really - maybe I should some time :). I just discovered your blog while I'm prowling about trying to find help for my very damaged nails. I fell in love with CND Shellac to the point where I bought the light unit and polishes. I'd been wearing it continuously for about a year and a half (professional trained me on application and removal), when I figured I should give my nails a rest. I stopped wearing it on August 1, 2013. Now, over nine months later, my nails are still a mess. They peel (I believe this is called delamination?) from the tips to about a third of the way back, resulting in super thin, fragile, and sometimes painful nails. I take 10,000 units of Biotin daily, and have for a few years. I've been moisturizing and using Solar Oil on my nails and cuticles. I wear gloves for water contact. I tried Nail Envy and a few other products, and I've tried leaving them bare. They're just awful! Have you ever heard of something like this?